Acupuncture has been around for over 4,000 years but was exactly is Acupuncture and what is is used for? Acupuncture is often referred to as being a Complementary or Alternative Medicine (known as CAM) and derived from Chinese Medicine thousands of years ago. To summarise Acupuncture treatment is brief, it is simply the process of inserting very fine needles into specific points on the body for therapeutic or preventative purposes. In the Orient, Acupuncture has been used to treat just about everything and in today’s world, it is commonly used to treat many different common ailments and conditions. The medical model upon which Acupuncture is based is that of one completely different to Western Medicine. The two camps generally struggle when speaking with each other simply because Acupuncture is based on an ‘energetic’ model and one in which the vocabulary is different. Chinese Medicine is based on the understanding that energy (known as ‘Chi’) should constantly be flowing freely throughout the body and when this energy gets stuck, is when illness occurs. Illness comes in many different symptoms and the majority of people who undergo Acupuncture, do so for ailments that have been with them for some time, usually for many years. The way in which Chinese Medicine would diagnose these ailments is that at some point in the past, their body experienced some energetic shift. It may be that there are no actual physical symptoms but they tend to be fleeting or re-occurring every now and again. These could be symptoms such as stomach pains, headaches or stress and are ailments that are not visible and that would not show up on an Xray. Treating these symptoms early with Acupuncture can prevent them from growing into other larger more serious physical ailments at a later date. Energy flow or the ‘chi’ can be interrupted and research has shown that there are two main ways that ‘chi’ can be interrupted. The first is through the pathways and meridians and the second way is the spinal column. So, let’s take a look at the Meridians and discuss what those meridians are and their names. The Meridians consist of twelve pathways that can be interrupted in terms of the energy flow or the ‘chi’ and there are many techniques that can be used to measure those pathways and then treat them accordingly. The spinal column has many different points but the spinal column is also a huge link between manipulation and acupuncture. This is why the Chinese believe that it works well in treating humans! If you have a bone in your spinal column that is a little out of place, it will need to be manipulated to ensure that the nerve flow or chi does not decrease. This connection between manipulation and Acupuncture was first made when researchers discovered that the Meridian flows over the spine, both front and back. When people talk about Acupuncture, the first thing they think about is needles. However, there are actually different forms of Acupuncture as well as needle Acupuncture and they are Electrical Acupuncture and Laser Acupuncture. The reason why so many people associate ‘Acupuncture’ with needles is simply because they think of the word ‘puncture’ and then assume this is puncturing the skin with the needles. 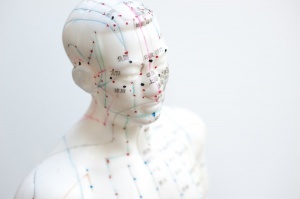 As mentioned previously, Acupuncture has been around for thousands of years and due to this, there are certain points on the human body that are diagnosed to treat certain ailments and conditions. Knowing these specific points on the human body, means that a qualified Acupuncturist knows exactly where to place the needle and which points need to be stimulated. However, it might be that a certain point on the body only needs stimulating and that the skin resistance only needs breaking, which is why other forms of Acupuncture were introduced, as well as needles. Researchers found that if they could break the skin resistance without actually puncturing the skin and still get the same results, they could then use other methods. The ‘Patch’ type of Acupuncture has a bead, which can either be stainless steel, gold or silver and which one used is determined by the effect you are receiving from the treatment. The bead is simply placed on the specific point on the body but does not break the skin itself. Instead, an electric charge transmits through the skin and it is the charge that then breaks the skin causing an energy impulse to stimulate the area, providing the same result as the needles. The ‘Ear Press needle’, is commonly used in the area where its name suggests, the ‘ear’. The ear has 159 points and the ‘Ear Press Needle’ can be placed in the ear at a certain point which can then be left in the ear for a period of time (usually a week or two). The Ear Press Needle usually has a waterproof material on it to make it more durable for the length of time it is required to stay in the ear. There are also other types of Ear Press Needles but these have magnets and springs that increase the energy flow. These are commonly used for addiction therapy, stopping smoking and weight loss. The Intradermal needle is usually used on an area that is a little heavier tissue or muscle. It is not waterproof and it is not the most comfortable needle due to it not having a guide and generally being a little longer in length. One of the main concerns that people have about visiting an Acupuncturist is whether or not the Accupucturists are fully qualified and rightly so. There are many questions that people have about Acupuncturists such as, what are their credentials, what qualifications do the hold, where did they do their training, how long have they been in professional practice and how good are they. These are all valid questions and ones that you should rightly ask. Here are a few things to should take into consideration that might help you determine which Acupuncturist you choose. Try to find someone you trust. Now obviously, if you have never had acupuncture before then you will probably be thinking “how can I do this if I have never been to them before?”. However, what I mean is that you should try to find somebody that may have treated you for another ailment but who also practices Acupuncture. If you do not know such a person, then try to find and Acupuncturist that has been referred and recommended by a medical professional you trust or somebody that you know who has already received Acupuncture. If you do not know anyone who practices Acupuncture or know anyone that can recommend one, then it is advisable to contact the appropriate governing body to ask if the can recommend and Acupuncturist in your area. It is essential that you chose a fully qualified Acupuncturist that holds all the relevant certificates and qualifications.